Traditionally an also-ran in the high-stakes entry-level subcompact sedan and hatchback marketing jousts, the 2014 Hyundai Accent covers both styles adequately, sports a few styling and feature upgrades, and is rumored to be in line for a major next-gen reworking for the 2016 model year. As of today, however, this half-pint Hyundai once more comes in the GLS sedan trim level, while the utility-minded hatchback editions are delivered in either GS or top-shelf SE variants. All trims are front-wheel-drive, and all flaunt a standard inline 4-cylinder (I4) powerplant with either a standard manual transmission or an available automatic. Moderate changes to the Accent lineup from last year include an available B&M Racing sport shifter for the Accent SE Hatchback, along with standard telescoping tilt-wheel steering and an upgraded stereo. All trims, meantime, get a driver’s side blind-spot mirror, some subtle cosmetic work to the front and rear fascias, upgraded wheels and, again for the flagship SE Hatchback, projector headlights with LED accents. The traditional variable-valve-timed (VVT) 1.6-liter I4 engine remains, as mentioned, the sole power offering lineup-wide, and can again be mated to either the standard 6-speed manual transmission or an available 6-speed automatic. Power numbers are pegged at 138 hp and 123 lb-ft of torque with either transmission, while mileage remains estimated at 28 mpg city/37 highway, no matter the transmission choice. Toting-wise, the GLS (sedan) offers a somewhat cramped 13.7 cubic feet of trunk space, while each hatchback variant boasts 47.5 cubic feet of hauling capacity with the rear seatbacks folded. Standard appearance and cabin bling in the 2014 GLS sedan includes 14-inch steel wheels, heated power-adjustable outside mirrors, cloth upholstery, full power accessories, tilt-wheel steering and air conditioning. The standard audio system, meanwhile, assumed to still feature a single-CD player with 6 speakers and satellite radio, is slated to be upgraded with voice recognition technology this year, as well. Moving up to the GS Hatchback, look for such additions as standard cruise control and body-color exterior moldings, while the high-end SE Hatchback is expected to flaunt 16-inch alloy wheels, a rear spoiler, premium cloth upholstery, Bluetooth hands-free calling and, new for 2014, telescoping tilt-wheel steering. As is traditional in this segment, much of the standard equipment endowing the higher Accent trims is available to lower trims as options. All trims do, however, remain eligible for such add-ons as carpeted floor mats and splash guards, with the high-end SE Hatchback available boasting the aforementioned B&M Racing sport shifter (automatic-transmission-equipped trims only), and an auto-dimming rear-view mirror with remote garage door opener. Finally, noteworthy standard safety features in Hyundai’s 2014 Accent lineup include 4-wheel antilock brakes (ABS), traction and stability control, front side-mounted airbags, front head restraint whiplash protection, and front and rear head airbags. The top-shelf SE Hatchback, meanwhile, throws in standard front fog/driving lights and turn-signal-integrated mirrors. 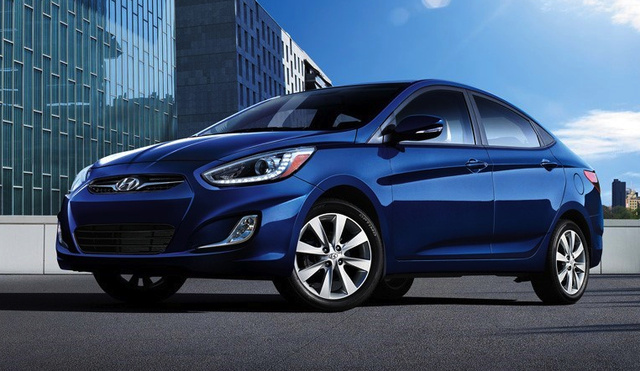 What's your take on the 2014 Hyundai Accent? Users ranked 2014 Hyundai Accent against other cars which they drove/owned. Each ranking was based on 9 categories. Here is the summary of top rankings. 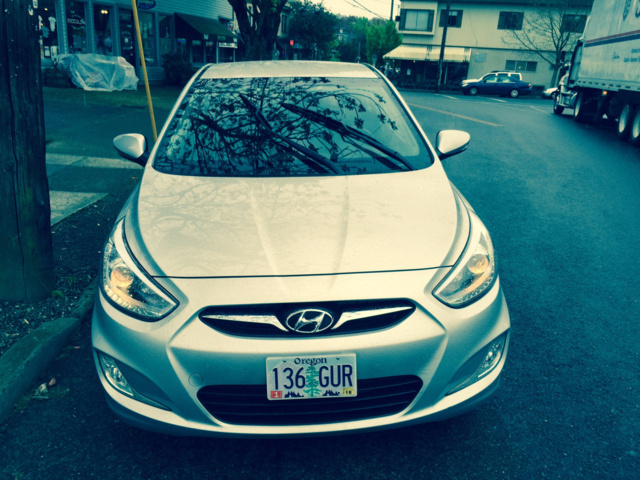 Have you driven a 2014 Hyundai Accent? Should I keep the "slippery off" signal on or off in a normal wheather conditions? Am interested in trading in my car that I'm financing, trade down and have a lower monthly payment..